The details for this year’s Annual Dinner have taken longer to finalise than expected, as The Mill at Elstead was unfortunately flooded at Christmas. Initially it was thought that they would reopen by the beginning of March, but the damage was worse than they had first believed, so now it will be mid-March at the earliest. It was therefore necessary to find an alternative venue, which has now been done, enabling us to retain the date of 1 March. Guest Speaker – Josie Dew, cyclist, adventurer, writer, cook, mum… and CTC Vice President. It is a real honour that Josie has agreed to be our guest, and will be coming along with her husband, Gary, and 6 month old son, Jack. I have heard her speak before, and can vouch for the fact that she is very entertaining, with a wealth of amazing stories. 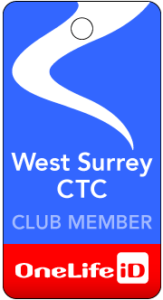 Booking – I will need your menu choices and full payment by Wednesday 19 February at the very latest (no need for any prior deposit); please hand to me on a ride, or send to me at 4 Park Avenue, Camberley, Surrey GU15 2NQ, making cheques payable to CTC West Surrey. If you no longer use cheques and wish to pay electronically, please contact me on johnmatsouthview@btinternet.com, and I will advise you of the Club’s bank details. Although I quote the latest date for booking above, I would much appreciate early booking, so that I know that we have sufficient numbers to make this a viable event – so why not do it right now. I certainly hope that it will be well supported, last year’s dinner appeared to be well received, and with such a superb guest speaker (and a reasonably priced meal, I am sure you will agree), I am really hoping that this will be a successful social event.